The international scientific-theoretical and applied journal «Social and Economic Phenomena and Processes» is registered by the Ministry of the Russian Federation for the press, TV and radio broadcasting and mass media, the certificate of PI № FS77-5043 of July 3, 2012. Founder of the journal are: Tambov state university named after G. R. Derzhavin (Russia). Partners: Tsindaossky university (China), International Slavic Institute «Gavrilo-Romanovich Derzhavin», the Republic of Macedonia), Pan-European university «Aperion» (Bosnia and Herzegovina). The journal is registered also in the International center ISSN in Paris (number ISSN 1819-8813) that provides information about it in the corresponding international abstract editions. 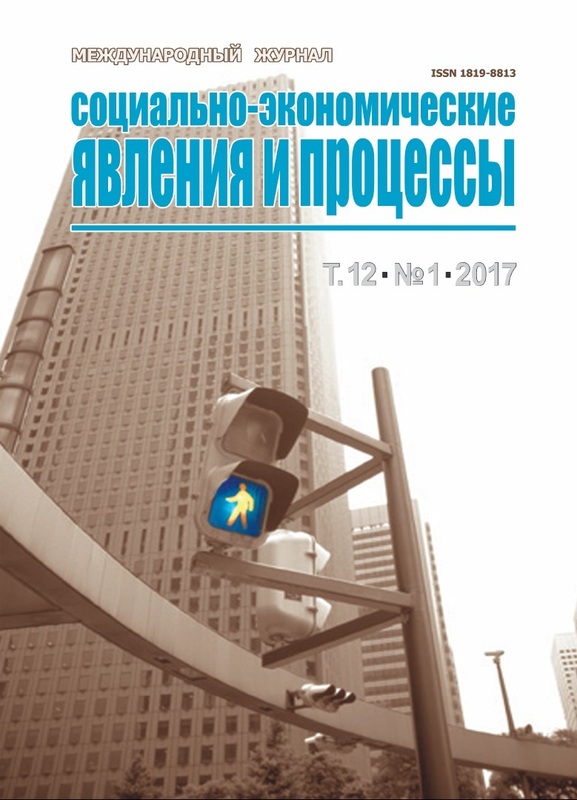 The edition comprehensively takes up questions in the field of sociology, economy and law, allows deeply and in details to investigate modern problems of the academic science and to develop specific proposals on formation of the mechanism of development of scientific capacity of our countries. Applied character of the journal gives the chance to carry out scientific discussions of scientists from the different countries on its pages. The journal is issued since 2006. For years of the existence the journal received popularity in scientific community of Russia and abroad. Among authors of the journal foreign countries are widely presented by scientists of universities of America (University of the State of Indiana), Germany, China (Tsindaossky university), Macedonia, Bulgaria, Korea. Authors of the neighboring countries represent Belarus, Kazakhstan and Azerbaijan, Uzbekistan, Tadzhikistan. It reflects development of scientific researches in higher education institution, increase in number of post-graduate students, doctoral candidates, applicants for degree, and also growth of interest of third-party authors as the journal received wide popularity in scientific community of Russia and abroad. The edition is issued with frequency of 6 times a year. Since 2010 the journal is included into the List of reviewed scientific journals and the editions issued in the Russian Federation and recommended by the Highest attestation commission for publication of the main scientific results of dissertations. The journal is a participant of partnership: CrossRef, «Committee on ethics of scientific publications» and professional community «Association of Scientific Editors and Publishers (ASEP)». Besides, on a site www.elibrary.ru the full text version of the journal under the contract with RNEB (RINTs) on drawing of the full text version of the issues of the journal, since 2009 (it is updated quarterly) is placed. Information about published articles on the established form is regularly provided in system of the Russian index of scientific citing (the contract № 328/08/2012 of August 6, 2012). It is indexed: Russian Index of Scientific Citing (RISC), CrossRef. The general guide to formation and the edition of the scientific journal is carried out by editorial board headed by the editor-in-chief. The editor-in-chief of the journal – the Doctor of Economics, professor, the head of the political economy and modern business processes department Vladimir Dmitrievich Mamontov. Expansion of geography of distribution of the journal is one of the most important requirements of HAC for its inclusion in «the List …». In the journal the strong group of authors was formed. All this testifies that the journal plays an essential role in development of scientific and educational potential not only the central region, but also Russia as a whole, in expansion of information exchanges and strengthening of ties between scientific communities of the different countries. Requirements of HAC are the most important factor of growth of quality indicators of the «Social-Economic Phenomena and Processes» journal. According to these requirements, for an expert assessment of manuscripts all articles arriving in edition pass reviewing not less than at two members of an editorial board and other leading experts of university in the corresponding scientific directions. The «Social-Economic Phenomena and Processes» journal publishes materials in the directions: 08.00.00 – Economic sciences, 22.00.00 – Sociological sciences. Edition acquaints with reviews of authors of manuscripts and is ready to present them by inquiries of advisory councils to HAC. The works placed in the «Social and Economic Phenomena and Processes» journal, automatically get to abstract journals according to the corresponding profile. The journal history, structure of the editorial board, the rule for authors, contents of numbers and information on authors are in an open entry on the website of the university. Information on the published articles on the established form is regularly provided in the system of the Russian index of scientific citing. All publications of the journal contain summaries, key words, bibliographies in the uniform format established by system of Russian Science Citation Index. In the journal information about authors with the indication of their place of work, positions and contact information take place. Rules of submission of manuscripts by authors who are strictly observed by an editorial board are regularly published in issues of the journal. In case of refusal from the publication of materials and the negative review the motivated conclusion is sent to authors. The journal reserves the right for a retraction of articles. The editorial office of the journal does not render paid services. 392000, Tambov, Internatsionalnaya St., 33. Actual address: 39200, Tambov, Sovetskaya St., 6. Ph. : 8 (4752) 71-22-01, additional 4043.